This wind turbine makes use of funnels and tubes to harness wind energy. 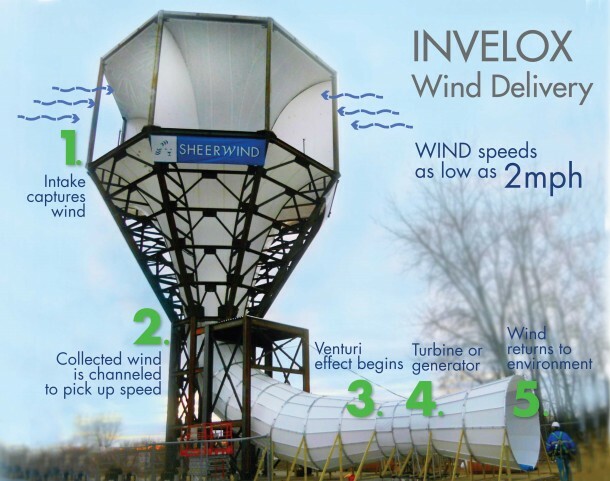 The Invelox turbine is capable of harnessing wind energy from winds which are as slow as 2mph and that is made possible by directing the wind into a funnel and then channeling it via a tube to the generator of turbine located on ground. Usually the wind turbine generator is situated on top of the tower. However, Invelox keeps the generator on ground and directs wind to it. The other obvious difference being that in conventional methods, wind energy is harnessed when it passes through the blades. With this design, that wind is captured via a funnel that leads to the generator.